You’ve recently moved into a new home. In the process of buying the home you hired a home inspector to check on the conditions of the major systems in the house. He or she checked the foundation, plumbing, heating and cooling. The report identified a few problems, nothing to do with the chimney, and you were able to work these out with the seller. Now, you’re looking forward to cozy evening with a fire in the fireplace or wood-stove. You’ve called a reputable company to sweep the chimney. The chimney sweep comes down from the roof and says, “I have bad news.” He or she then describes a problem that may cost hundreds or thousands of dollars to fix. You say, “I don’t understand. We hired a home inspector when we bought the house, and he didn’t say anything about that.” The chimney sweep may even chime in, “Well, all the home inspector had to do to see it would have been to...” This frustrating scenario is an all-too-frequent occurrence. Why does it happen? Homeowners, real estate agents and chimney sweeps often don’t understand the scope of a home inspection. Not all home inspectors make it clear to their customers what their inspection entails. Nor do all homeowners or prospective homeowners carefully read the home inspector’s report. 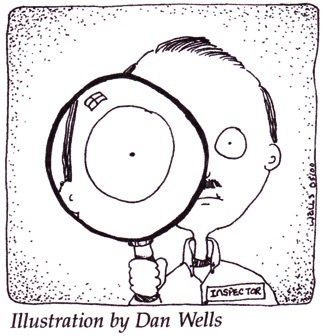 And of course, the quality of home inspections varies with the knowledge and conscience of the home inspector. The American Society of Home Inspectors says, “ASHI professionals perform a visual inspection and produce a written report of the condition of residential properties for buyers or owners. The purpose of such an examination is to describe observable major defects which require repairs. There are several such trade groups for home inspectors that publish standards of practice. In some states, law regulates home inspectors and defines the standards of practice. What do home inspectors look for around chimneys? Many home inspectors will recommend in writing that the chimney be cleaned and inspected by a professional chimney sweep. “If the customer doesn’t do that, they have no cause to complain about the home inspector,” Priesing says. Some home inspectors are not well versed in chimneys and venting systems. Relatively few home inspectors come into the business after working as chimney sweeps or venting contractors. Priesing is among a number of chimney sweeps across North America who give presentations to home inspector groups in an effort to help them understand what they are looking at when they observe chimneys, and to familiarize them with the capabilities of competent chimney sweeps. Fully equipped modern chimney sweeps often carry video scanning equipment that can show the condition of the inside of your flues and directly pinpoint problems. A competent chimney professional will also be able to inform you of building codes and product listings that are applicable to your situation. When preparing to buy or sell a home with a combustion appliance, be it a furnace, fireplace or wood-stove, it is advisable to obtain a detailed “Level 2” inspection of the chimney and venting systems by a certified chimney company. The standards of the National Fire Protection Association (which are the standards of inspection that certified chimney technicians are tested on) state that a Level 2 Inspection is required upon the sale or transfer of a property (for an explanation of a Level 2 Inspection see the page on this website “Levels of Inspections Explained”) and they also recommend that chimneys be inspected after any operating malfunction or external event likely to have caused damage to the chimney; upon replacement of appliances; and whenever verification of the suitability of the chimney for continued service is needed. Don’t get caught up in a game of who should have found what. Remember that your family’s safety is the first priority. If there are problems with your chimney or venting system, get them taken care of right away! Reprinted, with permission, from the July 2000 issue of SNEWS, The Chimney Sweep’s Newsmagazine, an independent trade magazine for chimney service professionals, 3737 Pine Grove Road, Klamath Falls, OR 97603 USA; 541-882-5196.